I love to snack and munch on things, particularly chips. But sometimes, I want the satisfying crunch, without feeling quite as guilty. I usually go for popcorn, although I never pick the simple healthy kind, so it sorta defeats the purpose. 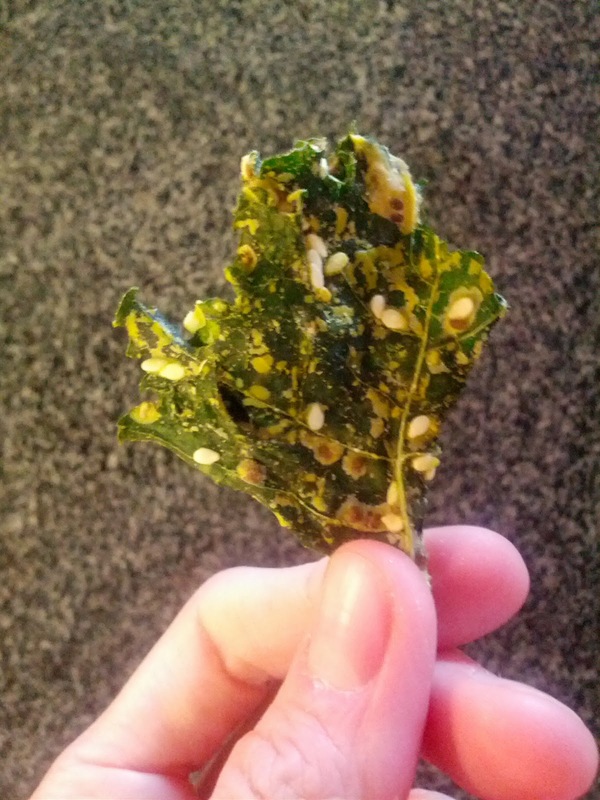 Occasionally, I also try out kale chips. I found some along time ago that I've really liked - super crunchy, fully of cheesy flavor (not from real cheese, but nutritional yeast, as they were vegan), but I haven't been able to find them again. I've resorted to making my own whenever I wind up with extra kale, and enjoy experimenting with different flavors, salty, spicy, etc. But, I still am never all that satisfied, so I continue trying new ones whenever I get the chance. So I discovered Freshly Wild Super Foods. They make two product lines: kale chips (er, "Kale Joy") and onion chips (you guessed it, "Onion Joy"). Both are dehydrated and come in a bunch of different flavors. 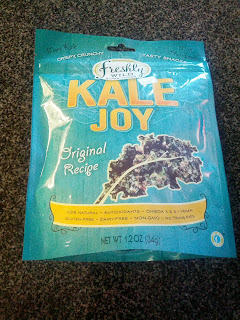 The onion joy actually sounds really tasty, but I've only seen their kale chips around town. The original recipe is "lemon juice, nuts, seeds, and a touch of salt", where "nuts" is cashews and walnuts. This seasoning mix wasn't super interesting, but it did have some flavor. My favorite kale chips use nutritional yeast to make them a bit "cheesy". These did have nutritional yeast, but somehow weren't that cheesy. The bag contained just over an ounce, and was a whopping $5.99 at Whole Foods. It was enough for a single snack. Way too pricy. The chips were well coated, and had a decent crunch. There was a mix of large chunks and broken up bits. But overall, just not remarkable. I didn't dislike them like the Brad's Raw Kale Chips, but I wouldn't buy them again, particularly given the price. More breakfast from Rosa Mexicano. A few days ago, I went to try out the new weekday breakfast buffet at Rosa Mexicano. I was very impressed with their offerings, although disappointed that the buffet didn't include the french toast from their brunch menu that I'd heard so much about. The chef let me know that the french toast would be on the buffet another day, so I rushed in to try it out the next time I had a chance. Since I reviewed the concept and all the other dishes in my last review, I'll skip that this time, and focus just on what was different this time. I confirmed a few details on this visit. San Francisco is the first Rosa Mexicano location to try out the breakfast buffet. 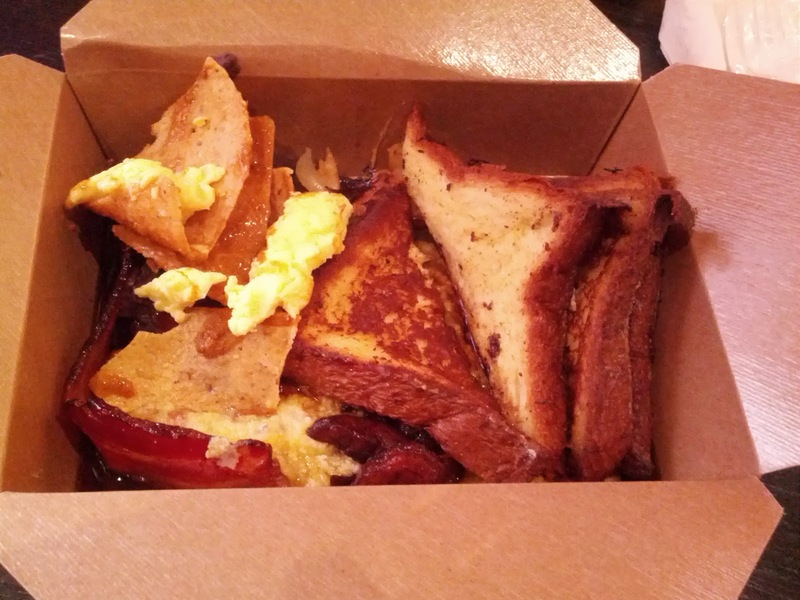 The other locations offer weekend brunch, but not breakfast. Given the location right on the edge of the Financial District, it makes sense. There are a slew of hungry office workers walking right by, who would love something besides a muffin for breakfast. Rosa Mexicano will likely be doing the buffet only togo-box style, rather than also offering a plate option, although you can still stay and eat there in the bar area if you choose. So you'll go to the register at the bar, pay, get your box for $11.99, and then fill it up as full as you want. Drinks (coffee, tea, water, orange juice) are also included for the price. The menu will be changing daily-ish, rotating through a bunch of different entrees, always featuring about 3 different entrees, 4-5 sides, and fruit. Most of the dishes come from their weekend brunch menu, although adapted for the buffet setting. I was again impressed, both by the quality of the buffet, and by the friendliness of the staff. It was an incredibly welcoming environment, a really delightful way to start my day. Was it as good as fresh food? Obviously not, but for a buffet, a breakfast buffet at that, it was very well done. If you work in the area, and like a little flavor in your morning, I recommend. A jumble of mexican breakfast: chilaquiles, black beans, potatoes, soft corn tamal, french toast, bacon. The buffet was very similar on this visit, featuring the same side dishes, but swapping out the mexican scrambled eggs for the french toast. They also altered the serving style of some of the dishes slightly. The first time, the buffet line started with the entrees, this time, with the sides. I'm not sure if it was intentional, or just what people started doing. They again had fresh cut fruit, including watermelon, which I skipped due to allergy. Along with the fruit was Activa flavored yogurts, but again, no granola, and no plain yogurt. The sides offered were all exactly the same as my previous visit: refried black beans, breakfast potatoes with onions, bacon, and soft corn tamal. I was shocked by how good the black beans were on my first visit, and enjoyed them again, so creamy and flavorful. They were topped with a bit of queso fresco too. The soft corn tamal was again about the same, creamy, with a bit of kick of jalapeño, a nice texture from the grind of the corn, and delicious bits of bacon. The potatoes were again pretty boring, albeit with tasty caramelized onions. This time, I also tried the final side, the bacon, which I had skipped on my previous visit. I do like bacon, but it didn't look particularly good last time, but then I read that it wasn't just bacon, it was piloncillo bacon, aka, candied bacon. So I had to try it this time. Unfortunately, I was correct the first time to skip it. There were some pieces that were very soggy and flabby. The fat hadn't really been rendered out. There were others that were too cooked, very crisp, and actually tasted a bit burnt. But it all just tasted like oil. I didn't get any candied flavor at all. My least favorite dish of all visits, and I wouldn't try it again. This time, along with the sides, were two different salsas, a red and a green. I mentioned last time that there were no condiments and that something like this was needed, so I was very glad to see them, and added some of each to my tamal and beans. Both were ok, but not nearly as good as the sauce on the chilaquiles. Speaking of the chilaquiles, which I fell in love with the first time, they were arranged slightly differently in the serving dish this time. The first time, the tortillas were on the bottom, smothered in sauce, topped with scrambled eggs, topped with ham. I was worried that they'd get soggy this way (although, they didn't when I had it). This time, the eggs/ham occupied the front half of the serving platter, the smothered tortillas the back half. I didn't really notice any difference in the taste of the dish with this alternate serving style, although it was easier to compose my plate the way I wanted - more delicious smothered tortillas, less ham. I again skipped the breakfast burrito. I heard many people happily commenting about it, so I think if you wanted a healthy whole wheat burrito with egg whites and veggies, it was probably good. But my eyes were on the french toast. As I mentioned in my last french toast review, I adore good french toast. But I often find it so boring. It continues to amaze me how much variance there is in french toast. Is it just plain white bread, barely dipped in egg batter, not really spiced, and served with fake maple syrup? Or is it thick sliced brioche, crusted in nuts, topped with a fruit compote, and amazing flavored whipped cream? Or somewhere in between? So many options! The brunch menu boasts an incredible sounding french toast: "cinnamon-cascabel chile crusted brioche bread, stuffed with Mascarpone cheese, topped with caramelized plantains". It sounded like all the elements of success: good spicing. Brioche, a great base for french toast. Not just whipped cream, but Mascarpone, stuffed in it. And to top it off, caramelized plantains, which I totally love. The buffet adaptation was a bit different. There was no mascarpone, not as stuffing, nor as a side. The chef said that he didn't think it would work well in the buffet. It was just the french toast in a serving platter, no stuffing, no topping. In a pitcher on the side was plantain piloncillo syrup. The french toast was pretty standard buffet french toast, although made from a really nice brioche. It was unfortunately a bit soggy. I didn't taste the cascabel chile at all. Some slices were much darker than others. Some were a bit dry, but I had one slice that was super moist and custardy. That one was really kinda amazing. The syrup was very sweet, and tasted almost like it had some citrus in it. The flavor on the finish was definitely plantain. It was loaded with slices of fried plantain, that were unfortunately not that good. They were just fried, and cold, so not that successful. The french toast was a slight let down, but I'm still very curious what it is like on the brunch menu, when prepared fresh. I don't really blame them for the french toast, it was a buffet after all. Jumbled food aside, it was also a bit awkward to eat out of, since the sides were so high. Makes sense if you are taking to go, less sense if you are eating in. But my bigger issue was the sauces. I added the salsas on top of my beans and tamal, but they got mushed into everything else. Not a huge deal, as salsa did go well with everything. But the syrup from the french toast was a bit of a disaster. It got everywhere. Every single item in my box was covered in the syrup, even though I thought I carefully just drizzled it on the french toast, and only walked a few feet away to a table. Sweet syrup on the tamal was actually good, but I didn't really want my beans soaked in it. They should definitely add little cups to put the sauces/syrups in. So, overall, still quite good. The chilaquiles were again the serious winner. That sauce is just incredible. I'd buy bottles of it if I could! The sides were mostly good, flavorful, added some additional textures, and helped round out the meal. The french toast was a bit of a letdown, but I'd still get it again. They are clearly still working out some kinks with figuring out how to best offer the breakfast buffet, but for $11.99, particularly if you load up your box, it is a pretty solid deal. As I mentioned last time, the buffet includes a drink station, with several types of tea (mint, green, english), and both regular and decaf tea. 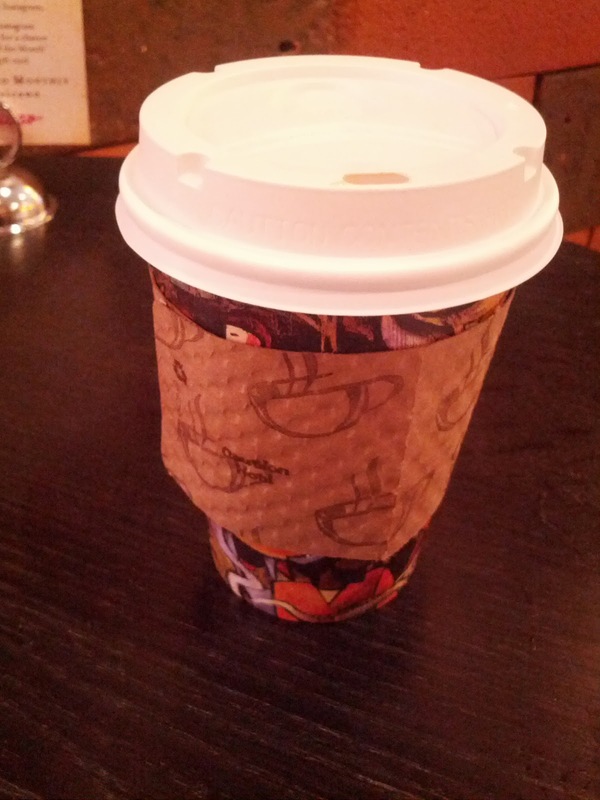 I again had the decaf, and it was again good. I honestly don't understand how their decaf is so good. Decaf is never good! I double checked this time that it was indeed decaf, and they said it was. Some of the best decaf I've ever had.